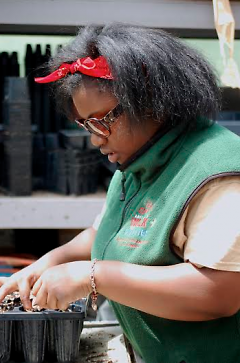 Urban high school students will be working along the watershed for eight weeks this summer, doing restoration and research to better understand how to address water quality issues in our area. 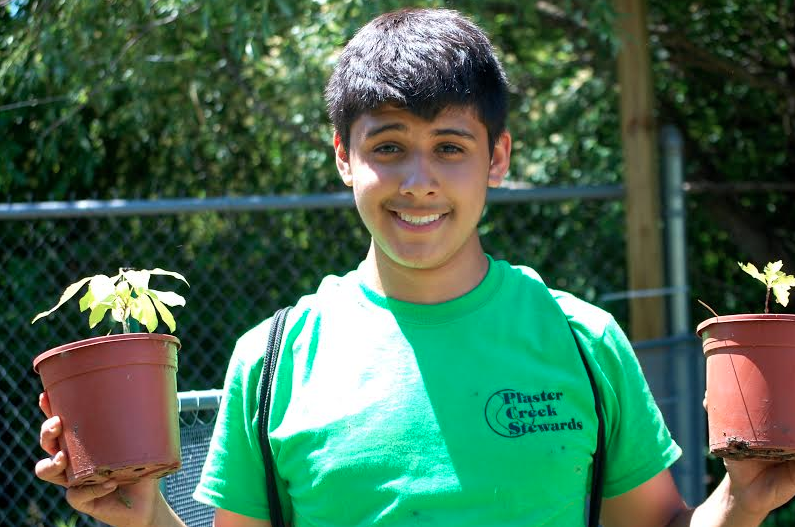 During the summer of 2013 the Plaster Creek Stewards piloted a summer “Green Team” for urban high school students who either live within or attend school or church within the Plaster Creek watershed. Gail Heffner and Dave Warners learned about similar programs being sponsored in Atlanta and Buffalo when they attended an EPA Urban Waters National Training Conference in Washington, DC in October 2012. As far as we know, the Plaster Creek Stewards Green Team is the first such effort here in the state of Michigan. Our 2013 Green Team experience was highly successful and we are poised to launch an expanded version of the Green Team this coming summer. The main goals of this program are to provide urban youth with hands-on training in watershed restoration and green infrastructure installation, as well as to establish mentoring relationships between Green Team participants and college research students. 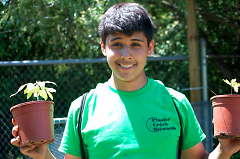 By working with Plaster Creek Stewards staff and volunteers, the youth will become sensitized to urban watershed issues and their relevance to environmental justice. A hopeful spin-off benefit is that the college experience will become de-mystified for Green Team participants as they consider higher education in their future. Last summer, with funding from the Michigan Colleges Foundation, we hosted eight students who were involved in a variety of watershed restoration activities including planting and weeding rain gardens, collecting native seeds, planting seeds and transplanting seedlings in the greenhouse, performing plant rescues, tending the native tree nursery, learning about storm water runoff and upstream-downstream connections within the Plaster Creek watershed. 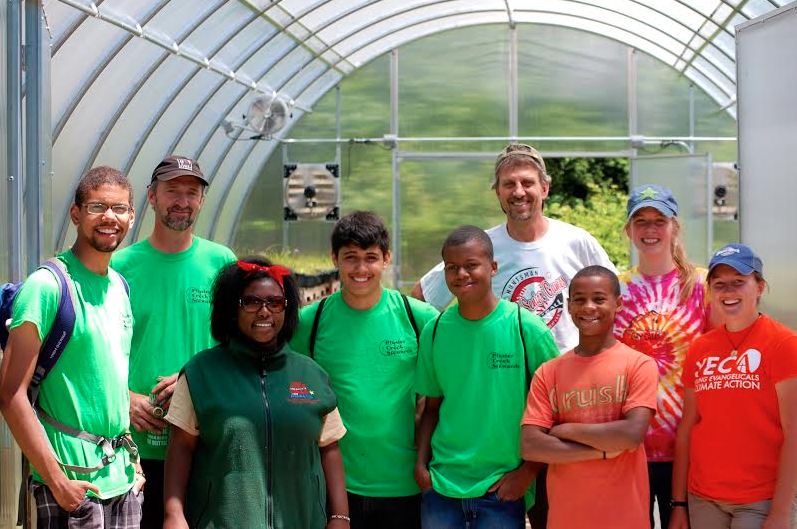 Members of this Green Team increased their awareness of ecological problems occurring within their own communities and developed an increased understanding of environmental justice. They also had a lot of fun working together as a team on projects to address problems associated with urban waters in the places where they live. This restoration work is ongoing because the problems within the Plaster Creek watershed are significant. Thanks to internal funding from Calvin College, the 2014 Green Team will be working for eight weeks this summer doing many of these same activities but they will also be involved in more research to better understand how to address water quality issues in our place—the Lower Grand River watershed. We recently learned that this effort was chosen to receive an EPA Urban Waters grant to fund an expanded Green Team in the summers of 2015 and 2016. A particularly exciting aspect of the EPA proposal is replicating Plaster Creek Stewards’ Green Team with youth from the Rogue River watershed. These two sub-watersheds have very different demographics and environmental conditions, which will provide opportunities for comparative learning with respect to upstream-downstream issues. By building bridges between subcultures and promoting cross-cultural understanding, participants from the more urban Plaster Creek Watershed and the more suburban Rogue River Watershed will be addressing environmental justice issues together. When relationships develop and concerns such as these have "faces," people become motivated to take action. Empowering these high school youth as change agents who are aware of ecological and public health issues in their community is one aspect of a larger effort to restore urban waterways of the Grand Rapids area. Because Grand Rapids has been designated as an Urban Waters Federal Partnership much attention and many exciting projects will be happening in the coming years, contributing to the ongoing restoration of the Grand River. Plaster Creek Stewards (PCS) is a collaboration of Calvin College faculty, staff and students working with local schools, churches and community partners to restore health and beauty to the Plaster Creek Watershed. PCS focuses on three areas—education, research and on-the-ground restoration. Our goal is to educate the community about watershed ecology, and to develop a dedicated group of people who understand the strengths, needs and problems of the watershed. Our education events are always combined with opportunities for action, and we work to equip people with the knowledge and skills needed to restore health to the watershed. We have discovered that by educating young people we can reach their parents and engage a broader community in caring for our local water resources. To learn more about Plaster Creek Stewards, see our web page.